I've been feeling a little bit deflated this afternoon. I finished my book last night that I've been reading for the last week, and it feels like something is over. 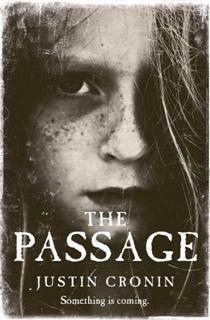 I was reading The Passage by Justin Cronin and it was really good! It's one of those books that I just couldn't wait to get home and keep reading, I wanted so badly to know what was gonna happen. But at the same time I didn't want it to end and almost made myself slow down so as to draw it out just a little bit longer. The anticipation each afternoon as home-time closed in, knowing that in just a few hours, once Dave was tucked up in bed, I could pull it out and dive back into the world of The Passage was almost unbearable (don't tell Dave I said this!). There's been a few other books that have made me feel that same sense of excitement just thinking about reading them. The first book I ever remember that feeling of "oh wow, this is just soooo good I wish I could read it forever" was with John Marsden's Tomorrow, When the War Began. I found that book in the school library about a year or two after it first came out and I took it home and read it from cover to cover that night. I just couldn't put it down. And when I had finished reading it, I had that same bitter-sweet feeling. The fact that there were 6 more to come (4 of which I had to wait to be written!) helped to ease some of that feeling, but I couldn't get them quick enough! Harry Potter and The Time Traveler's Wife are other books that brought me that same sense of excitement just thinking about reading them, and the only thing I wish is that I could read them again for the 'first time'! Do you know what I mean? One other recent book that made me read from cover to cover non-stop was The Hunger Games. Hands down the best young adult novel I've read since Tomorrow, When the War Began. If you haven't read it yet then I suggest you read my review and then grab a copy as the third and final book in the trilogy comes out in a couple of weeks so you need to catch up! Have you ever felt like this about a book or am I just a weird bibliophile-freak? It's sad I know, but some books are just sooo good! You're not the only one - i'm the same way when i really get into a book. I love that when I'm stumped for a book to read (not that it happens much) I can read through your reviews and go straight to the libraries website and put a "hold" on the book. I don't think I would have picked this one, but your review and comparing it to two other books I love makes me want to read it. Thank you! I totally know what you mean about the bitter-sweetness of getting to the end of a book. I can't wait to find out what happens and then the disappointment of having to let go of a character I love sets in. I am interested in getting hold of this book and giving it a go (will suggest it to my bookclub). You read different books to me, but I am always up for something new. Thanks for the review.